Psalm 100:2 Amp. Serve the Lord with gladness! Come before His presence with singing. Ephesians 5:19 NAS Be filled with the Spirit speaking to one another in psalms, hymns and spiritual songs, singing and making melody in your heart to the Lord. Recent studies reveal that just ten minutes of singing - whether you are in the car, the shower or anywhere else - not only slows your breathing and heart rate, it also causes your blood pressure to drop by up to ten points! The researchers explain that the vibrations singing produces in your throat then travel to the brain causing an increase in the release of endorphins, those brain chemicals that cause us to relax and feel good. God encourages us to enter His presence with singing! 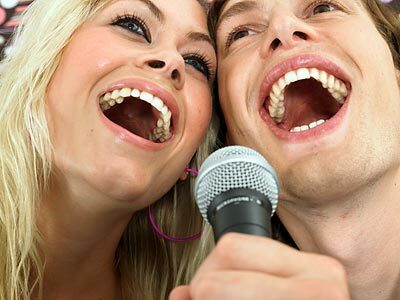 You may think you cannot sing - that your voice is terrible. He commands us to come before Him with singing - so we are definitely able to do so. You may not have what is considered a beautiful singing voice - I don't. In fact, you may think your singing sounds more like noise than music! That's ok. Remember He also tells us in Psalm 66:1 to "make a joyful noise" unto Him!! Even if your singing sounds more like noise to you, as long as it is joyful, it sounds like the sweetest music imaginable to Him. And you are improving your health at the same time. How like our God to multiply our every effort to please Him. Make it a point to play some beautiful praise and worship music in your home or car daily. You will notice it positively impacts your mood and even changes the atmosphere in your home! In fact I have noticed that the more I listen, the more the words get down into my spirit and I wake up in the middle of the night with those words going through my mind. So I feel as if I’m singing in my sleep! And don’t be embarrassed if you feel your voice isn’t very good. You don’t have to sing in front of anyone else – simply sing before Your Lord. He loves hearing you! Ya know, this article made me think of how God is always there for us. I always listen to Christian music when driving in my car and when I'm at home doing housework or yard work I carry my IPhone around with me. It has a praise and worship app on it that I absolutely love listening to. When I'm finished with daily chores I generally take a 30 minute rest or so and of course the wheels begin to turn in my mind. Sometimes when distressing thoughts come God immediately flips back on my IPhone and I suddenly hear the praise and worship music as loud and clear as if I had turned it back on. These words continually repeat over and over again calming and relaxing me and reminding me that God is with me to comfort me always! !